The author of the Echoes of the Fall trilogy shares an insight into his writing process. The author of the Echoes of the Fall trilogy shares an insight into his writing process. The Hyena and the Hawk, the final book in the trilogy, is published in hardback and ebook now. “Backwards” is probably not the most constructive thing to say, in answer to that question. “Doing it wrong” is also, I suspect, another popular interpretation. So: I start with the setting, the world. That’s what fires me up about writing a fantasy or SF book. I honestly don’t think I could do it any other way. “I want to write a story about a middle-aged politician pulling the tail of a merciless empire and doing spy stuff” is not going to germinate into Shadows of the Apt. “A girl is torn between her mother and her father’s heritage and runs away to find herself” isn’t going to give you the shapeshifters of Echoes of the Fall. But “A world where everyone has the powers of insects and some of them can do steampunk and others can do magic” gives you Stenwold Maker and his spy rings and clashes with the Wasp Empire. “A world where everyone is a shape-changer” leads very naturally to Maniye springing Hesprec from captivity and running off into the woods. For me, it’s getting the world in place, in detail, consistent and immersive to me, that gives me my characters and plots. Stenwold and Cheerwell, Tisamon and Grief in Chains, they all arise from the world itself. The clashes between Collegium and the Empire, the tragedy of the Mantis-kinden, the technological acceleration of the Air War, all these are the driving plots of Shadows of the Apt, but they also follow organically from the setting, and from each other. At the end of Salute the Dark, I could just stand back like a farmer after planting, and see exactly what would grow from that combination of world details and past events. Everything in Children of Time arises out of my desire to explore the world of the Portiids. Even major details like Understandings arise as emergent properties of the settings, and then get put to work like little scuttling pit ponies for the benefit of my imagination. Get the world right and the story will emerge, and it won’t just by “go everywhere on the map and then defeat the dark lord” unless the world you have made is as flat and dreary as that. In making a detailed world you create complexity – multiple viewpoints, philosophies, cultures, a riot of diversity, and just like in real life the interaction of those complex systems go on to create things you wouldn’t necessarily have ever thought of alone. 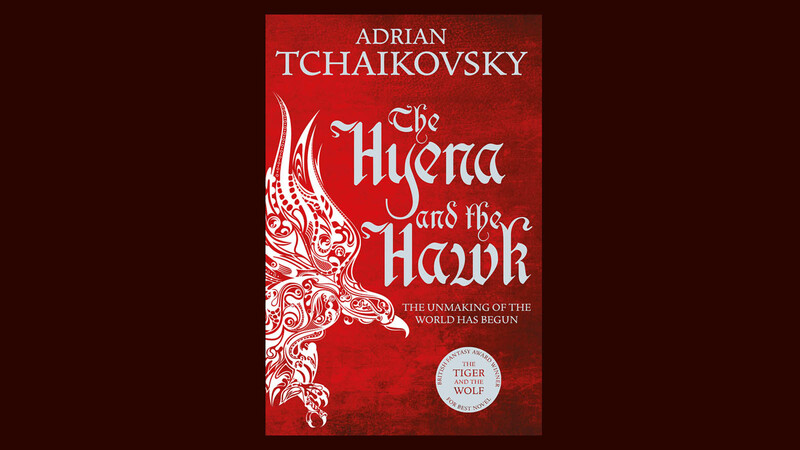 The Hyena and the Hawk by Adrian Tchaikovsky is available in hardback, ebook and audiobook now.